The controversial guide to the inner workings of the FBI. Ever wonder what an FBI agent really does? Mass surveillance and operational overreach have become major concerns, and it pays for all citizens to know how their government and its agents operate inside their borders. 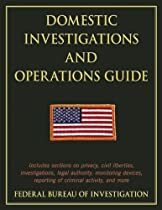 This guide ย“applies to all investigative activities and intelligence collection activities conducted by the FBI within the United States or outside the territories of all countries. This policy document does not apply to investigative and intelligence collection activities of the FBI in foreign countries; those are governed by the Attorney General’s Guidelines for Extraterritorial FBI Operations.” Now, anyone can get their hands on it! The FBI is one of the most secretive government organizations in the country, but with this guide you can peek inside and view what only FBI agents know. This recent unclassified text reveals their ominous powerย—see first-hand how quickly your rights can be taken away by them. You will be shocked by what you read!